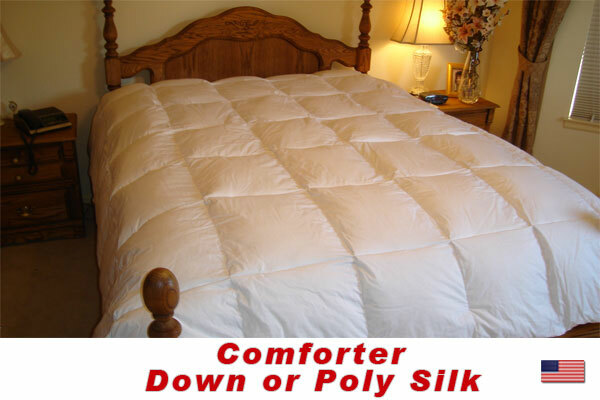 Full XL Comforter, Choose From: Pure White Down, Feather and Down or Poly Silk Custom Comforter. Full XL comforter SIZE 82 inches by 92 inches. This is a Medium (standard weight) comforter. Design your own awesome comforter! Choose from white goose down, 50/50 feather and down or poly silk. ALSO, choose from light weight, medium weight or heavy weight thickness. Where else than BeddingDirect.com! Poly Silk (allergen free synthetic). Feels like pure 100% down. Our comforters are custom made for you. We use a soft 230 thread count white cotton fabric for the shell. Comforter shells are box stitched to keep our fill materials in place. YOUR GOING TO LOVE YOUR COMFORTER!!! Thes Full XL Comforter, Down, Feather Down or Poly Silk Custom Comforters measure 82" x 92". Choose fabric and thickness.